He is only saying what Hollande and others are saying: either Germany has to accept transfering huge amounts of money into other people's economies, or the Euro will fail; because few of the other countries can live in the same Euro as Germany. 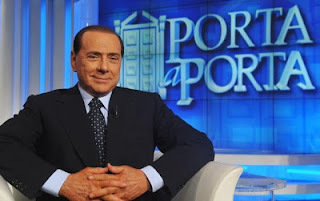 Funny if, in the end, the European nations are saved by Berlusconi. Who is paying for Greece? Who is going to subsidise Spain? Who will bail out Italy? Meanwhile, with Italy, Spain and France facing funding costs of €332bn, €195bn and €243bn respectively, markets will be kept on edge. See what I mean, in your own words? I'd say it'll be up to the Italian people eventually: whether to vent thru the polls their own enthusiastic support for additional tax burdens and go on with the Monti cabinet austerity agenda, as purported by the media, or reject it. A first chance of true democracy despite hidden vested interests conspiring against? Monti is by far the best person to guide Italy through this part of the crisis. By far the best understanding where things have to be adjusted and with by far again the most credit by EZ partners and markets. However credit is definitely not perpetual. Furthermore he needs political backing to make the reforms (which has been a problem the last 1/2 year or so). No use for him to step in if he is not backed to do structural reforms. Otherwise he will be the figurehead of a disaster. You need Monti and backing, Monti alone is not enough. I doubt (although not aware of all the ins and outs of Italian politics) if running for one party will give him a bigger chance to get structural majority backing. The country simply doesnot seem ready for structural reforms. Probably make a later return when the country/politics are ready more difficult. Structural reforms or not, Italy will never be able to live in the Euro. They will always be a poor set of regions; unless of course the Lega Norte, the only sustainable bit, leaves Italy. Then the rump 3/4 of the country will fail to live in the Euro.